Asian shares clawed back most of their weekly loss after rising firmly on Friday as strong Wall Street earnings and a step forward on U.S. tax reform brightened the mood, though many hurdles remain to secure passage of a tax-cut deal. The dollar fell after The Wall Street Journal reported Special Counsel Robert Mueller’s team last month subpoenaed more than a dozen officials from President Donald Trump’s campaign for documents containing specified Russian keywords. “The noose is tightening, approaching the inner circle,” said Marshall Gittler, Cyprus-based chief strategist at ACLS Global. Futures portended mostly solid openings for markets in Europe, with European stock futures and DAX futures each up 0.1 percent, and CAC futures marginally higher. FTSE futures were down 0.1 percent. MSCI’s broadest index of Asia-Pacific shares outside Japan was up 0.6 percent in late afternoon trade. But it was down 0.1 percent for the week. 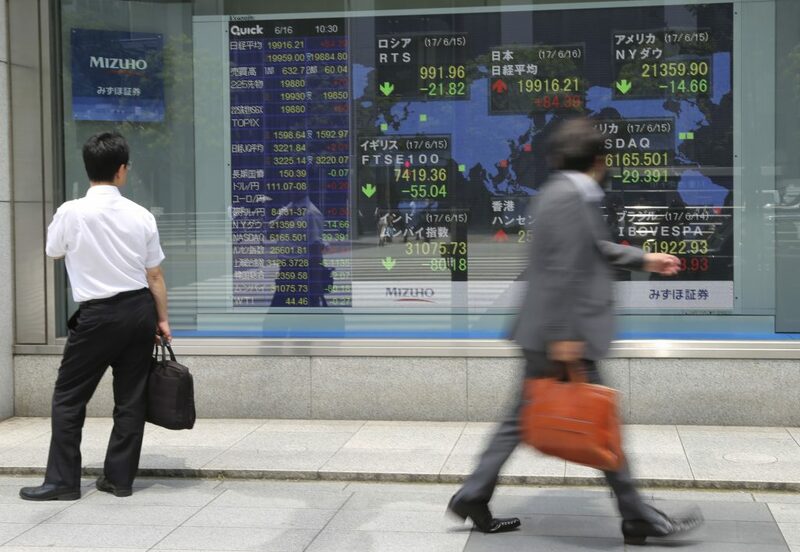 Japan’s Nikkei gained 0.2 percent, extending its recovery from a near three-week intraday low hit on Thursday. But it was down 1.3 percent for the week, snapping its nine-week gaining streak. The U.S. House of Representatives approved a broad package of tax cuts sought by Trump, passing its first, if smallest, hurdle and providing a catalyst for fresh buying in risk assets. The tax debate now moves to the U.S. Senate, where that chamber’s separate plan has already encountered resistance from some Republicans. No decisive Senate action is expected until after next week’s Thanksgiving holiday on Nov. 23. Wall Street’s main indexes rose sharply on Thursday, boosted by strong gains in Wal-Mart and Cisco following their earnings. The S&P 500 advanced 0.82 percent to turn positive for the week, a day after hitting a three-week low, while the Nasdaq Composite added 1.3 percent to a closing record high of 6,793.29. MSCI’s broadest gauge of the world’s stock markets stemmed its five-day losing streak and posted its biggest daily gain in two months, of 0.80 percent, on Thursday. Junk bond prices rebounded sharply, with iShares High Yield Bond ETF gaining almost one percent to recoup more than half of its losses since the start of the month. “The markets had been wary of a fall in credit products during the last few days but it seems we just had a healthy correction. As the European Central Bank and the Bank of Japan are still pumping liquidity, the world’s asset markets will be supported,” said Masahiro Ichikawa, senior strategist at Sumitomo Mitsui Asset Management. The positive mood on Wall Street helped to lift the yield on two-year U.S. notes to a nine-year high, with a Fed rate hike in December seen almost as a done deal. Fed funds rates futures are now pricing in about a 90-percent chance of another rate hike by June next year, the highest level in recent months and up from about 50 percent just over a month ago. The U.S. dollar, however, lost momentum and fell broadly following the media report about Mueller’s subpoenas. The dollar skidded 0.4 percent to 112.57 yen, hitting its lowest level in almost a month. It was down 0.9 percent for the week against its Japanese counterpart. The euro gained 0.3 percent to $1.1808, edging back toward its one-month peak of $1.1862 touched on Wednesday and up 1.2 percent for the week. In Asian foreign exchange trading, countries with current account surpluses saw their currencies gains. The Korean won rose to its highest level in over a year, gaining more than 2 percent this week, while the Thai baht hit a two-year high and the Malaysia ringgit a one-year high. Bitcoin hit a record high of $7,997, quickly recovering from its 30-percent plunge last week. Oil prices were on track for weekly losses, slipping from two-year highs hit last week on signs that U.S. supply is rising and could potentially undermine OPEC’s efforts to tighten the market. U.S. light crude stood at $55.35 a barrel, up 21 cents or 0.4 percent on the day but still within its trading range in the past couple of days. It was down 2.5 percent on the week. Brent futures hit a two-week low of $61.08 a barrel and last stood at $61.24, down 12 cents or 0.2 percent on the day. It was down 3.6 percent for the week.